classic and whimsical portraits of children by award winning photographer susan white. Let us capture your childs' special sparkle in portraits that will become a "treasure of the heart". They will change and grow but their portraits will forever capture them at that certain age you love. We always schedule enough time to allow your children ( and you! )?to become comfortable and to have fun. We can take our time during the session as we only accept one portrait commission a day. Our collection of child size furniture and antique toys adds a pictorial charm to many of the portraits we create both in studio and outdoors in our three acre photo park and gardens. If desired, we're happy to provide classic clothing and fun hats and headbands that add to the creation of a great portrait. Or.. we can just keep it simple. Whatever kind of portrait you imagine decorating your home, we will create it for you! 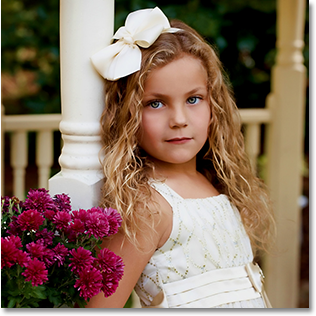 Our studio has specialized in photographing children of all ages for over thirty years, and has won many national awards with images of our clients. We are proud to say that four of our portraits were published in Fujifilm's " Children's Portrait Awards" book. We often give seminars to other professional photographers about photographing children and families. If you desire a true work of art of your children, look no further than Photography by Susan White.